One of the hottest outdoor living trends in the New England area this year is a custom designed wood arbor to add function and elegance to your exterior space. These hardworking structures can support trees, shrubs and other greenery, while also bringing texture to any outdoor area. Here are a few ideas from the exterior design pros at Tiefenthaler, on how to incorporate a structure into your landscape. While they can be constructed of many types of building materials and incorporate any style, arbors are a design focal point that acts as a natural doorway to welcome guests to your exterior space. The climbing plants that grow up and around the structure enhance the look and add softness, especially flowering vines and shrubbery. 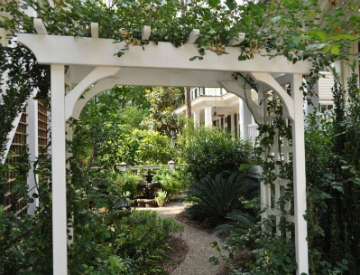 You can also incorporate aromatic plants that offer a beautiful scent as you stroll through the arbor. The design flexibility of an arbor means you can go with any style to coordinate with your home, landscaping and the rest of your exterior space. A tailored arbor in white-painted wood with brass details makes a classic statement, and enhances the look of a colonial-style home. For a more rustic design, you can incorporate reclaimed wood and weathered iron hardware. The possibilities are endless when it comes to the shape and structure of an arbor. The traditional model is rectangular or square with wooden beams that support plant growth. However, you can also consider arched beams for a softer, more graceful style. Another option is use of lattice-work that adds elegance and class. The Tiefenthaler Construction experts can tell you more about how an arbor is one of the most popular outdoor living trends around Fairfield County, CT. Please give us a call to talk to a specialist about our exterior design projects, custom millwork and outbuilding construction.